The Pawnee National Grassland is a 193,000 acre combination of federal, state and private land, administered by the USDA Forest Service. 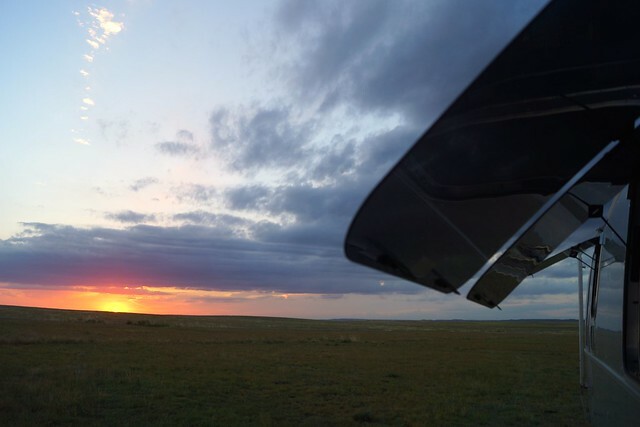 National Grasslands are managed as National Forests. Both are made up of private and public land, not always readily differentiated, so you must know where you are. Knowing where you are is much easier in the Grasslands than the Forest. Dispersed camping regulations and maps are published by the USDA. To select our spot I relied on the USDA motor vehicle use map combined with in-car GPS. We arrived on Friday evening. Pitch black. Now it’s Sunday evening. We’ve seen four cars pass between then and now. It wasn’t what I thought it would be. I’ve lived on the plains for a long time. Grass, scrub, cacti, rattlesnakes, I thought I got it. But we haven’t found solitude like this before. Our time in the various National Forests of Colorado have been peaceful and inspirational. Although we have been all alone we have known the location of our nearest (camping) neighbor – perhaps further up a canyon or down a different forestry road. As you explore you run across one another. People like the forest. Out here, where I can see the furthest, I couldn’t tell you where the nearest person is. The silence. It seems people don’t like the Grasslands. One additional difference is National Grasslands are accessible. While National Forests are effectively moated by private subdivisions, creating a physical and legal minefield of accessibility issues, the Grasslands are relatively unencumbered and can be accessed directly from county roads. Easy. Beautiful. You can see our photographs of the weekend here. Summer and rving is busy. At first I thought it would just be a little annoying around holidays and weekends. But now fully into July, we have found most campgrounds and rv parks are packed. Which then I started feeling homeless, thinking I was going to have to live in the Wal-Mart parking lot all summer. Towards the end of May we bought our 2000 watt generator. My first real boondock was just one overnight in the San Juan National Forest. We got there, took a walk, I cooked a normal dinner, watched a movie, went to bed. The exact same things I would have done if we had a full hookup site. The next morning, we took showers, had hot water, I even used a blowdryer thanks to my new generator. Everything worked out just fine and I started to really consider that boondocking just might not be so bad after all. The next time we found ourselves to be “homeless” was the 4th of July weekend. We decided to go into a National Forest and just give it a try for a few days. We found ourselves in a lovely valley surrounded by mountains on both sides. From that spot onward I have fallen in love with boondocking. I was worried at first about boondocking for a number of reasons. Thinking that I would run out of power, not be able to shower, do dishes, use my computer, or even watch a movie. All of my doubts have been eliminated. First off power, we don’t have solar panels, but we do have a generator. While boondocking we ran the generator about once a day, for approximately two hours to recharge our batteries. It also runs when I use watt heavy appliances, for example my hairdryer and blender (to make green smoothies!). Things that our inverter wattage can not handle. That power issue is not an issue at all now. Eventually we might add some solar panels and a higher watt inverter. But for now the generator is working and does everything we need. Water was my biggest worry heading into the forest. The airstream holds 39 gallons of fresh water, how are we going to live for days off of 39 gallons? The average person uses 80-100 gallons of water per day! To my happy surprise we made that water last with flying colors. We did a few things to help make this possible. Highest water usage are two things, showers and washing dishes. As far as showering goes, you have to do the navy shower. For a person with a lot of hair, this was a bit more challenging. But I wash my long hair and the water still doesn’t run out. I have read from other blogs some people use dry shampoo to save even more water. I have not had to go to that extreme yet. Dish washing is the 2nd water problem. While boondocking we use paper plates, cups, and plastic silverware. Cutting down the amount to be washed by at least half or maybe more. The only items that then need to be washed are the pots and cooking utensils that can withstand heat. After I dish out the food from the pots, I take a paper towel and just wipe the pot clean. That way when I go to wash it up, it takes an even smaller amount of water to get it clean. Hand washing and even toilet flushing takes precious water. We brought along a bunch of hand sanitizer and wet wipes to keep hand washing to a minimum. For flushing, spray it down with a water vinegar mix instead of flushing with water. To add to our water supply we have 7 gallon water totes. Currently we have 3 of them. With our current setup we can go about 4 days on our fresh water tank. Add in our totes of water, we can easily boondock for a week now without much trouble. streamer_a has a water pump that makes filling the water tank from the totes very easy, it is quick too. The other item that plays a role in boondocking is propane. During the warm months it is not used very heavily, but you still couldn’t pull off a comfortable week in the forest without it. Our propane runs the refrigerator and is used for hot water. I only turn on the hot water when I am about to do something with it. You would not want to leave it on all day like you normally would with the electric heat. Just having those few modifications has really opened up the world of boondocking. Currently traveling around Colorado and having all the National Forest at our disposal is very inspiring. We plan to stay here for awhile and continue to venture ‘Into the Forest’. See all our week of June 30th-ish photographs here. A hectic 1,208 miles of towing week. It started when we left Pomona State Park on the 27th. Our goal was simple – to escape humidity and bugs by getting to elevation. The entire itinerary was unplanned. We stopped when and where we wanted, which worked out more or less. We were also lucky enough to stop at two National Parks: Great Sand Dunes and Mesa Verde. We drove past, but did not stop at, the Sand Creek massacre site. If I had known the historical significance (shame on me) I would have certainly stopped. The dunes at the Great Sand Dunes National Park are the tallest in North America, as high as 750 feet and very stable. Comparing today to a 1874 photograph reveals the dunes have changed very little in over 100 years. 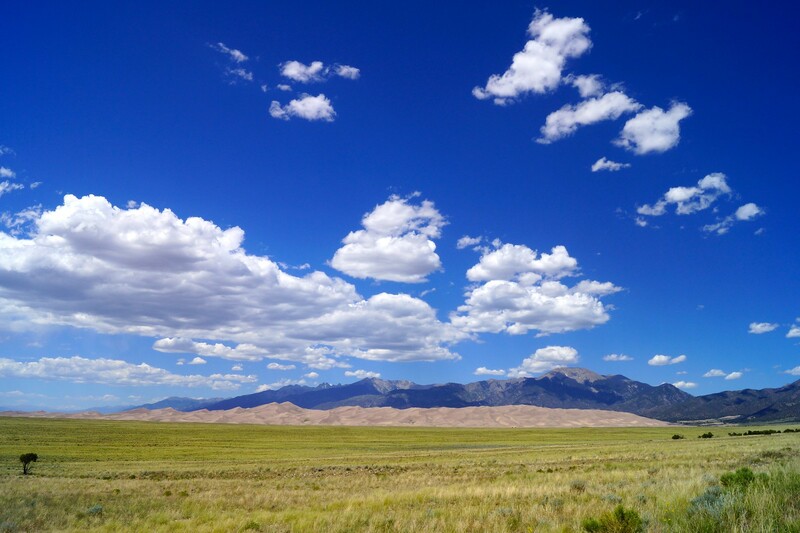 The immediate – immediate being over 400,000 years ago – cause of their formation was wind action that piles sand from the the San Luis valley floor up against the Sangre de Cristo Mountains. This process continues today. The valley itself is the size of Connecticut and is pleasant to drive across. On the one side are the volcanically created San Juan Mountains, on the other the uplifted Sangre de Cristo Mountains, with the Rio Grande flowing through the sand and scrub in between. The valley was once a huge lake — Lake Alamosa. That ancient lake bed is the floor of the valley today. Every time we drive across we see small, localized, dust storms. One theory concludes that the lake ultimately breached the valley with the ensuing torrent forming the Rio Grande Gorge in New Mexico, which we drove through on our way to Taos in May. All of this information was lifted from the National Park Service. As we spend more time in Colorado the geography and history of this state become more fascinating. The area we have been exploring most recently has been the south western portion – Durango, Pagosa Springs, Alamosa, following US 160. The geography is stunning but I also enjoy observing the history and culture change with the landscape. Most of what we have been spending time in was Spanish and subsequently Mexican territory until the treaty of Guadalupe Hidalgo in 1848. The town of San Luis is the oldest in Colorado, established in 1851 by settlers from New Mexico. At this time the area was still part of the New Mexico Territory. Interestingly, this shows the area was still being settled by Spanish descendants even after the area moved under US control. That Spanish influence is still real today. You see it in the place names, people, cuisine and architecture to a more limited degree. As we were driving from east to west it began in southwest Kansas, and to me it marks the passage from the Midwest to the Southwest. 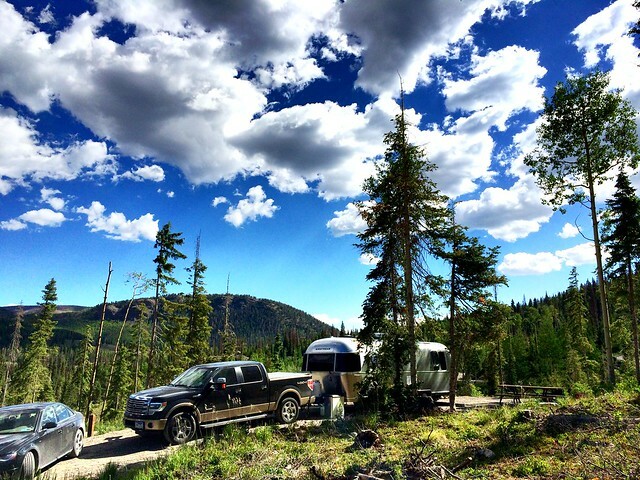 We also enjoyed three fantastic nights “wild camping” in the Rio Grande National Forest. 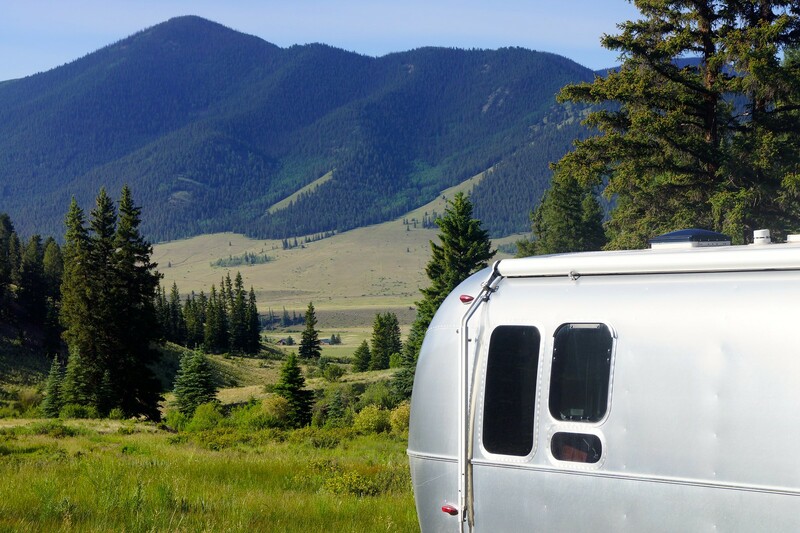 Our Airstream experience has been transformed by our confidence to go without hookups. streamer_j has committed to writing more about boon docking and I have another post brewing on this. We recently stayed at a very scenic spot in Colorado. It was in the Rio Grande National Forest at a remote campground called Big Meadow Reservoir. Here is a quick video of the waterfall that we hiked to find. It was about a 5 minute walk from our site.